we gave permission to create/edit files in one of the synced subdirectories to 3rd person. Permission was given with standard GDrive option in web interface. 3rd person doesn't have Syncdocs installed. This person uploads files in given subfolder and Syncdocs downloads them on our PCs without any problem. However, by some reason some (or even every) of these 3rd person's files are duplicated in the root directory on PCs and we can delete them only through GDrive web interface in the 'Recent' folder. /folder2 — Google account 'User2' can create and edit files/sub-folders here. User2 uploads (creates) file '1.docx'. / — file '1.docx' created here (duplicated). The owner is User2 (it's seen in a properties). /folder2 — file '1.docx' exists here too. Step 3. User1 deletes '1.docx' from the root only. This file stays in sub-directory folder2 (this is what is needed). Step 4. File '1.docx' is downloaded over and over again by Syncdocs in the root. But it is not present in the root folder if we check the GDrive in a browser. Step 5. The only way to delete this duplicated file from the root directory is to delete it from the 'Recent' of GDrive (by User1 or User2). Thank you for the detailed and clear explanation. It might be a simple problem, or it might be that an old Google Docs server issue has re-emerged. 1. Are user 1 and user 2 using Syncdocs, or are some using Google's Google Drive client? 2. Does this only happen with .docx files or does it happen with other sorts of files? 3. If you can, can you please send a log file, preferably from User 2, to contact-sycndocs@syncdocs.com, which will show us more details. You can get it by right clicking on the Syncdocs icon, selecting "Preferences", then "Advanced" and then "View Log". //1. Are user 1 and user 2 using Syncdocs, or are some using Google's Google Drive client? User1 uses Syncdocs on multiple PCs. User2 doesn't use Syncdocs or native GDrive app - only browser. //2. Does this only happen with .docx files or does it happen with other sorts of files? Any type of fyles (see below). User2 doesn't have Syncdocs installed. We did additional tests and have found the pattern! To reproduce this issue User1 just moves these User2 owned files to another folder on Windows. Syncdocs syncs these changes and voila - files are uploaded from nowhere to the root. I think that's because they are still shared by User2 to User1 in User2's GDrive account, so Google server reuploads them. Step 1. User2 uploads file '1.txt' to /folder1 with browser (not any Google Drive client app). User2 is stated as owner of this file in properties on a Google server. Step 2. Syncdocs of User1 syncs this file on a User1's PC to /folder1. Everything is fine now. Step 3. User2 moves (cut&paste) '1.txt' to /folder1/another-folder on his PC. Syncdocs syncronizes this change to server. 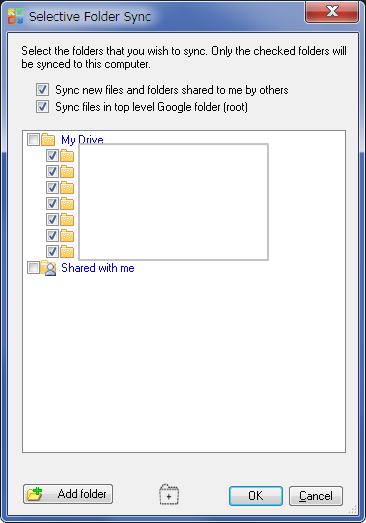 If we go to GDrive with browser we'll see that User1 became an owner of '1.txt' file in /folder1/another-folder. Step 4. Syncdocs downloads '1.txt' it the root synced directory on User1's PC (note that there's no such file in the *root* directory on a Google server). Being deleted from the root on PC, this file keeps downloaded over and over. Syncdocs' settings: http://i.imgur.com/VLtQLJt.png and http://i.imgur.com/KXMRtr6.png. Update: if we just delete this shared file (not move), the issue with downloading to the root is still here. Thanks for the detailed report. We've setup the exact same settings you have, but can't replicate the error you are seeing. User 1 and User 2 stay in sync. 1. Does user 1 have access to /folder1/another-folder ? We've tried it with and without access. "User 1 moves (cut&paste) '1.txt' to ..."
instead of "User 2 moves ..."
If you can, please send us the log file from User 1. //1. Does user 1 have access to /folder1/another-folder ? We've tried it with and without access. Yes. The directory to which User2 have got a permission is the part of the whole Google Drive account which belongs to User1 and he has access to any subfolders in it, whoever creates them. //"User 1 moves (cut&paste) '1.txt' to ..."
User1 moves, no mistake here. //If you can, please send us the log file from User 1. 15.03.2016 14:37:56(ver. 6.410) File filename.docx has no parent folder, but is not in the root. Thanks for your log file. It is useful. It shows Syncdocs detecting these orphan files as it should do. However, Google claims to have fixed this orphan issue in December 2015, so it is interesting that it is back. The problem dates back to 2013, as you can see from this Google Post. I'm still looking into the cause as we cannot replicate it, and it depends on the Google region that you are in, as the different servers in different data centers run different software. I might try a VPN into the region that you are in, can you tell me (via email if you want) where you are based? Email is sent. Thank you. Thank you, I got it. We will try from VPN server in your region. Hi, any updates on this? Should we contact Google support? It's annoying to delete a bunch of files every day with web interface. We can sometimes replicate the problem and sometimes not. Right now it looks like it depends on the Google server, but we're still looking into it, so will probably have a better idea towards the end of next week. We are looking into this issue this week again. We asked the Google engineers about it, but have not received a concrete response yet. Thanks. BTW, network monitoring tool shows Syncdocs and native Google client (different accounts) send data to Mountain View servers (like lg-in-f125.1e100.net), not Europe. Hi Phil! Maybe something has clarified about this issue? Google claimed the issue is fixed. Are you still seeing the issue? If so, please say what dates you saw it happen. Ok, thanks for the update. Is it possible to send us a copy of the Syncdocs log again to contact-syncdocs@syncdocs.com? Hello. Have you received my email?